The quickest way for a brand to earn my loyalty? Amazing customer service. And Almari Pret more than delivered. Almari Pret isn’t just a Desi clothing rental company — it’s a comprehensive service that takes ALL the hassle out of planning outfits for Desi events. So now you’re all probably wondering why I’m hyping up Almari Pret so much. Besides the fact that the clothing options are simply stunning, I have just honestly never experienced such a seamless, efficient, and convenient process. When I first spoke to the team from Almari, I was about to leave on a month long vacation. We exchanged a few quick emails in which I briefly told them my return date, picked out a few options I liked, and sent over my measurements that I had just taken for a bridesmaids dress a few weeks prior. When I came back from my trip, the Almari Pret team had my box delivered, ready and waiting for me as soon as I got home! They really thought of it all! I literally just did my makeup, grabbed a pair of gold heels and took the box with me when I went to take these pictures. The easiest preparation process I’ve ever had! 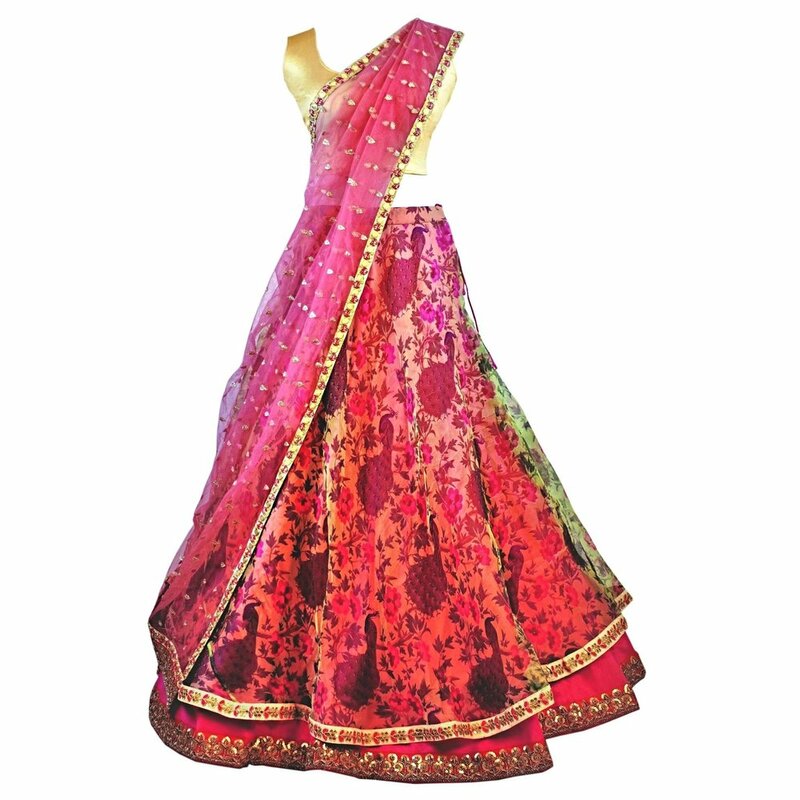 Next time you’re doing the arduous task of packing your outfits for a multi-day Desi wedding, imagine if you could just pick a few beautiful outfits online, take your shoes and makeup and not have to think about anything else? I am SO here for this. Once you’re done, just pack up your outfits and use the return label they sent you to send your shipment back and you’re all set. In addition to the obvious pros of renting your outfits such as saving money and space — Almari Pret offers the added benefit of all-around convenience. I could not have been any happier with my experience! Here are the outfits I chose, and a few more of my favorites from their site! Perfect for: receptions, sangeets, engagement parties, and just about any other evening event. You can never go wrong with a black and gold ensemble. This outfit had the perfect Indo-western flair that I look for in my traditional outfits. And best of all?! It was so comfortable and easy to move in! 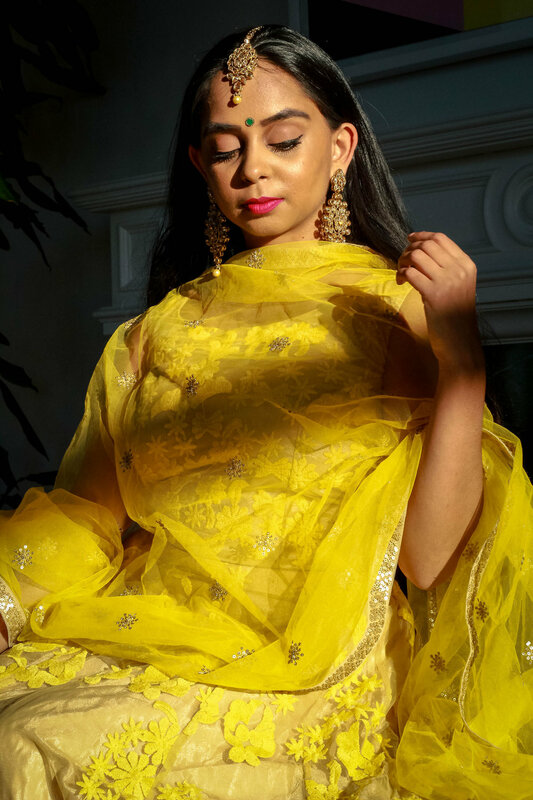 Yellow is slowly taking over my closet and my Instagram grid, so is anyone really surprised that I picked this yellow lengha? Probably not. Jokes aside — contrary to what I grew up believing — yellow looks amazing on most South Asian skin tones. Channel your inner sunshine and shine bright at your next event with this lengha! Perfect for: literally any event. This had to be my favorite piece that I borrowed. The colors and the way the whole look came together was just amazing. But I must say, the dupatta was my favorite part of the ensemble!